Farm-themed games have been popular for quite a while now, and it doesn't seem to be a problem for the fans of this genre. 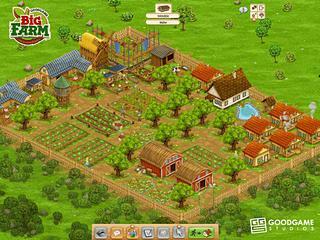 Big Farm is one of those addictively entertaining games. It features a great number of languages to speak the language of players from all over as well as a great number of tasks to keep them busy. All the characters are well drawn with some distinctive details to their personality and job. There isn't much of a story told before you start the game, but you do learn more and more about what's going on as you keep playing. This happens first of all as you meet more and more new character. Some of them are on your side to help you succeed (like the girl in the first image who is your neighbor), others are there to be your competition. Either way all of them stimulate the development and growth of your farm. 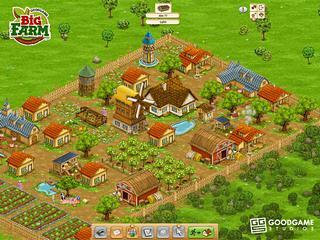 The game's graphics are very bright, colorful and attractive to the eye. All the characters are well drawn with some distinctive details to their personality and job. Now about the mechanics of the game. The game has quite an impressive number of languages to offer. But if you want to play in any particular language other than that chosen by the game for you, you should choose it right in the beginning before you start. The first character that you meet is your neighbor who is very helpful with explaing the basics of the game and showing you when and where to go for something. This tutorial is pretty short and easy to follow. The four sides of the screen are four different components of the game. The top of the screen is where you can see the rogress you've made money/gold/experience wise. The left side is where you get your tasks that direct all your actions. 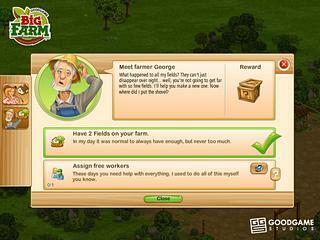 The tasks from different characters makes you usually to to the bottom where you have a panel for such segments as building or farm management. The right side is where your setting open up when you move you cursor over them. BION I'm imepsrsed! Cool post! Do not put any money into this game. They will trick you into loosing the gold you purchase with real money. I played this game for quite a few months. I could tell that the game was not fair for those who played the free version but I played anyway and went quite high in levels. Everything costs gold and you have to put money into it to get gold. You can build up gold but it takes a long time unless you put in real money to buy it. Then they put things in the game to trick you out of your gold. When one new feature took most of my hard earned gold away by mistake, I contacted them right away. They were unwilling to do anything. They tried to say that a few hundred gold coins would ruin there business. I think what would ruin there business is not treating there customers well. This is an unfair game and weeks of work can be lost with a click of the mouse. Do not play this game. This is Big Farm review. Download this game here.